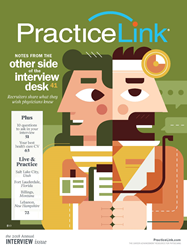 PracticeLink, the leading online physician recruitment platform, announce PracticeLink Magazine will sponsor their free physician job-search seminar – coming to Crowne Plaza Detroit Downtown Riverfront on Thursday, July 12, 2018 from 5:00 pm – 8:00 pm. Residents and fellows – as well as practicing physicians and advanced practitioners – are invited to this free event. "This job fair was an excellent opportunity to get your name out there as well as be able to see what is available for you.” — Jessica Bartock, D.O. Active, job-seeking residents, fellows, practicing physicians and advanced practitioners may attend this free job-search seminar, When to Do What in Your Job Search. This free seminar covers a 10-step job search timeline for residents and fellows, including what to include in a CV and how to negotiate a contract. At the end of the seminar, attendees will have the opportunity to pick the brains of our expert panel of physician recruiters during the interactive Q&A session. This free event takes place during one of PracticeLink’s free physician career fairs. Attendees will have the opportunity to speak with recruiters from facilities located in Detroit and across the nation. Recruiters from organizations such as Kettering Health Network, Trinity Health, Prevea Health, Charleston Area Medical Canter and Spectrum Health will be on hand to discuss their open opportunities. For a complete list of organizations exhibiting at the fair, please visit the website. PracticeLink Live! Career Fairs include dinner, drinks and dessert, enabling physicians and recruiters to connect in a casual atmosphere. Walk-ins, scrubs and families are welcome! Pre-register today and receive a $25 Amazon e-gift card when you check-in to the event. Prize drawings for a $100 Visa/Amex gift card will be held every 30 minutes with a final drawing for a $250 Visa/Amex gift card at 7:30 pm. See website for details. Crowne Plaza Detroit Downtown Riverfront 2 Washington Blvd. Detroit, MI 48226. To learn more about the event or to RSVP, visit info.practicelink.com/careerfair/2018-detroit. Email sarah.griffin(at)practicelink.com or call 800-776-8383.